Knox Gun Guy: Why are carry permits a bad idea? . . . . plus $85 more or less for the required training. This may not seem like a lot to you and me, but that is a lot of money for someone working for minimum wage, or a retired citizen on a fixed income. Yes? If you answer yes, then you need to understand a longstanding Supreme Court decision. The Court decided in 1968 (Haynes v. U.S.) that felons would not be required to comply with any gun registration laws, because compelling felons to register firearms would violate the Fifth Amendment protection against self-incrimination. 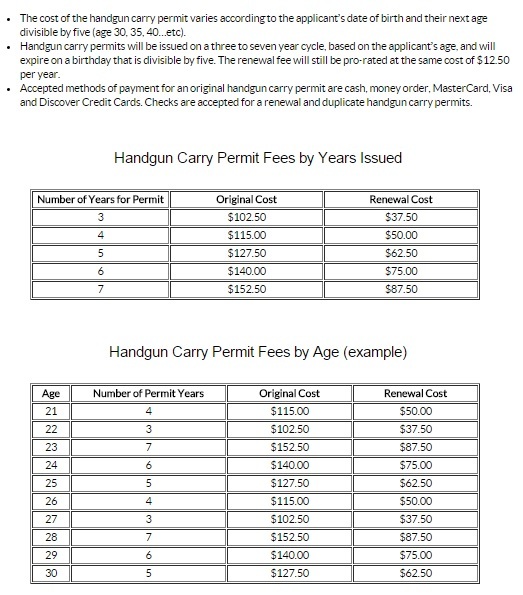 Is there any common sense in requiring that permits be purchased by decent citizens? Yes? We need permits so that police will know who's carrying a gun. But, criminals don't get permits. What good does it do for police to know who the "good guys" are that are carrying a gun. This response is not valid. And now, in Tennessee, we have almost a year's experience with non-permitted carry in vehicles. Police don't know who these individuals are when they make a traffic stop. Obviously, anyone who is going to keep a firearm for protection at home or bear one away from home needs training. But, states that have long allowed non-permitted car carry do not report any significant problems. We don't see newspaper reports of "untrained Georgia citizens" mistakenly shooting someone. Gun rights advocates should lobby their legislatures ceaselessly until permits are no longer required*. In the Commonwealth of Pennsylvania, a License to Carry Firearms (LTCF) is required to carry either concealed, or in a vehicle, or in the City of Philadelphia. Open Carry requires no license (except in Philadelphia). The license costs $20, is good for 5 years, and requires a one-page application. No training, no fingerprints, no nothing (except for a clean record). Right now, over ONE MILLION Pennsylvanians have an LTCF, and that's between one in eight and one in ten adult citizens. Pennsylvania expects the citizens to become familiar with the laws concerning firearms, which is the way it should be. Some years ago, in preparation for a trip to PA, I got a PA LTCF by mail. That was before PA honored TN PERMITS. BTW, great vacation! provisions and that there is no degrees of constitutionality." irrelevant. No state may convert any secured liberty into a privilege and issue a license and a fee for it"
I like the way we do it in Indiana. It costs about $100 for a lifetime license. It would be better if it was $20, but it is a onetime fee (we also have 5 year permits, but I don't think anyone applies for them - that would be foolish since the lifetime license costs just a few dollars more). The only benefit to licensing that I see is the convenience of being able to show an officer that you are legally carrying a firearm - it saves time. Though the situation has never come up for me. Roughly 1 out of every 8 adults (18 or older) has a license to carry a handgun in Indiana. "These citizens must make a difficult choice." Yes. Only vote for candidates that will enact legislation making carrying weapons similar to Vermont. It is a difficult choice that is an easy choice. Let them know how you will decide for whom you will vote. Gun laws are not meant for people having criminal intent. These are for the decent people to bound them so that they cannot do self defense without any hindrance from the government. The one benefit of carrying a license is that you can show it to the office that you are eligible to carry the firearms. I'm afraid once the Bureaucracy forms and money collection begins and an industry of fees and training springs up, arguments about rights become secondary to maintain these new found revenue streams. After permitting takes place "for the law abiding", getting to constitutional carry under the your second amendment right now makes politicians become faced with biting a hand that's now feeding them. Another reason it’s a bad idea creating financial rewards to deny a right. Thanks for the post. People who are really concerned about the safety of themselves and their loved ones may have the MA Gun License so as to make them feel more safer and get legally permitted to use the guns. Although this was a great article, It didn't really seem to match with how it is a bad idea. I adore guns and fully support people who are concerned about their safety and other too. Anytime one has to pay to exercise a constitutional right, it ceases to be a right, and becomes a privilege. That is a bad idea.